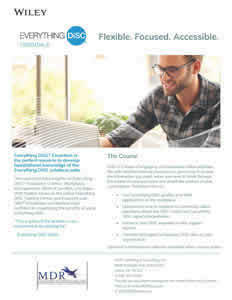 Everything DiSC® Essentials - Online Training - MDR Coaching & Consulting Inc.
Everything DiSC Essentials provides foundational DiSC® knowledge and an overview of the Everything DiSC full suite of reports to help you select and facilitate the best DiSC solutions that meets your team’s needs. This self-directed learning course contains 2-3 hours of online, engaging activities. With flexible access to the online Everything DiSC Training Center, you can work through the course at your own pace. See an Everything DiSC Essentials Brochure.